Quickly and accurately manage and maintain the stock details of the Company. Flexible and user-friendly accounting software is capable of creating new Company, Item, Party, Account, Customer etc with full password protection. 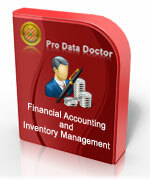 Software effectively maintains the final accounts of the Company. Managerial accounting utility is suitable for all small to large size business enterprises. Cost accounting software easily generates various reports including Balance Sheet, Trial Balance, Profit and Loss account, Item Report, Ledger Report, Sales Order Report, Purchase Order and Expense Ledger etc. All the generated reports can be easily saved at user specified location for later use. The accounts maintained using this accounting software is fully password protected and is completely safe from the unauthorized users.